Tarps Plus Blog: Boat Tarps Sold Here!! Tarps Plus now has a larger selection of Boat Tarps. Sometimes Boat Tarps can be expensive and sometimes we need something to do the job quick before having to run to the store and have 1 fitted to your boat, when those situations occur Tarps Plus is here with our Boat Tarp selection. Most Boat Tarps will ship right away and expedite shipping is also available for those who need it even next day. Having a Boat Tarp can save you hundreds of dollars in repairs to the interior of your boat. 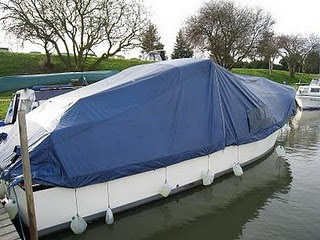 Even if you now own a Boat Tarp having a spare is always important when it comes to covering up something of high value. Today Tarps Plus is having a sale on all Boat Tarps, saving you an average of 60%, it is just to good to pass up. Check out the Boat Tarp section at http://www.tarpsplus.com/boattarps.html. We purchased 1 from your company and loved it. The price was great too! Your boat tarps are really great! We bought one last year and it lasted us through out the whole winter. I just wanted to let everyone know that Tarps Plus is the best place to purchase a boat tarp. Thanks Tarps Plus!! !